Online education in India is still passing through a transformation. In India, a major focus is given to traditional institutionalised education system that requires establishment of big infrastructure not necessarily justifying its costs. On the other hand, online education can provide cost effective, timely, qualitative and transparent education system of India. Another limitation of the traditional educational system of India is that it is largely academic in nature. Very few educational institutions of India are providing practical trainings and skills development courses while imparting education to their students and professionals. This has resulted in mass unemployment for a large majority of educated masses of India. As per many studies and surveys, only 20-25% educated population is fit for employment purposes in India. We must stress more upon technical education in India and technical education skills development in India. Skills development in India is an area that has still not got the attention of policy makers of India. This is more so regarding cyber skills development in India. Virtual campuses in India can solve many of educational problems of India. These problems include corruption, lack of transparency, lack of accountability, non qualitative education, monopolistic behaviours, etc. Virtual campuses can eliminate the corruption in higher education of India and bring fairness and competition among various stakeholders. Higher education in India needs reform especially the higher legal education in India. PhDs in India are suffering due to corruption. Similarly, lack of skills and expertise is also affecting higher education in India. Another area that has received limited attention of Indian government pertains to lifelong learning in India. For instance, till now Perry4Law Techno Legal Base (PTLB) is the exclusive techno legal lifelong learning institutions and centre of India. Professional continuing legal education in India is also missing. Although efforts in the direction of conducting bar examinations in India were undertaken in 2011 yet they are not coherent and well designed and managed. Bar examinations in India need to be properly managed and scientifically undertaken. The focus should be to evaluate skills and knowledge of the students rather than introducing another hurdle that is more on the side of formality. A better option is to scrap the bar examination altogether or conduct a very qualitative bar examination in India. Further issues have been introduced with the proposal to conduct Indian legal services examinations In India and Indian regulatory services examination In India. These examinations require a totally different outlook, orientation and preparation that are presently missing in India. As online education in India is going to grow, contents creation and its management would be a big problem. For instance, legal research in India is no good and plagiarism in India and other places is widespread. Further, the growing use of online advertisement for online contents has increased the demand and value for educational and non educational contents. In order to earn money through advertisement and e-learning methods, many individuals and companies are violating the intellectual property rights (IPRs) like copyright of others. Individuals and companies engaging in online business or transactions are required to observe cyber law due diligence in India. Cyber due diligence for companies in India requires that they avoid violating IPRs of others and also prevent the violation of the same at their own online platforms and websites. Countries like United States have created dedicated laws like online copyright infringement liability limitation act (OCILLA) in this regard. However, in India we have no such dedicated law for dealing with online copyright violations cases. Even the copyright law of India is not expressly dealing with this issue. However, Internet intermediaries’ liability in India, under the information technology act 2000 (IT Act 2000), covers this issue. The role and responsibility of Internet intermediaries in the field of copyright in India cannot be anymore ignored by various stakeholders. Even technological issues of IPRs in India must be kept in mind by all while dealing with others contents and IPRs. Liability of Internet intermediaries for copyright violations in India is very stringent under the cyber laws of India and contents of others should not be taken without their permissions. Perry4Law Techno Legal Base (PTLB) has been providing various techno legal e-learning courses in India. These include online legal education in India, online cyber law education in India, online cyber law trainings in India, online cyber law courses in India, etc. PTLB is providing the exclusive techno legal e-learning courses in India. The exclusive techno legal e-learning centre in India is also managed by PTLB. It is providing e-learning for lawyers in India, public legal awareness training in India, legal e-learning in India, online skills development in India , etc. There is no second opinion that Indian legal workforce needs to be skilled driven. Similarly, online education in India needs to be developed urgently. However, in order to achieve this task, we must do proper planning and actual implementation. The sooner it is done the better it would for all the stakeholders involved. This entry was posted in Uncategorized on December 31, 2011 by PTLB. Cyber laws in India are very important part of legal framework world over. India also has a cyber law in the form of information technology act 2000 (IT Act 2000). With growing emphasis upon e-commerce and e-governance in India, cyber law in India has become very important. However, we have no dedicated e-commerce laws in India and e-governance laws in India. With the proposed draft electronic delivery of services bill 2011 (EDS Bill 2011), some efforts in the direction of strengthening e-governance have been taken by Indian government. However, till now we have no mandatory e-governance rights in India under the cyber law of India. The cyber law of India has many unique and interesting aspects. Internet intermediary liability in India, cyber due diligence in India, cyber due diligence for Indian companies, social media due diligence in India, etc are some of them. With the passing of the information technology amendment act 2008 (IT Act 2008), the liability of websites, social media platforms, blogging sites, etc has increased a lot. Domain name protection in India is another issue that may become a part of cyber law in the near future. A lot of cyber crimes, cyber contraventions, intellectual property rights (IPRs) violations, etc are committed due to lack of awareness about Indian cyber law. However, many cyber crimes and IPRs violations are deliberately committed and they deserve to be taken seriously. There are very low cyber crimes convictions in India. This is because the cyber crime investigations in India are not proper due to lack of cyber law and cyber forensics knowledge. There is an urgent need to ensure cyber skills development in India so that cyber crimes can be prosecuted successfully. Perry4Law Techno Legal Base (PTLB) is managing the exclusive techno legal centre for cyber laws in India. PTLB is the exclusive techno legal e-learning institution of India. It is providing various techno legal e-learning courses in India and cyber law education and training is one of them. Online cyber law education in India needs to be strengthened further. Online cyber law courses in India can fill the gap in our educational system that is largely academic in nature. Such online courses can not only provide practical trainings and skills development but they can also remove the distance barriers. A special emphasis must be given to legal lifelong learning in India that is presently missing. Continuing professional legal education in India needs to be developed on the lines as has been done in western countries. Further, the legal and judicial fraternity of India needs scientific knowledge that has become necessary with the enactment of IT Act 2000 and similar technology related laws. There are certain areas that are closely related to cyber law. For instance, issues like cyber forensics in India, e-discovery in India, cyber security in India, etc have still not got the attention of Indian parliament. We need dedicated laws on each of such fields that are presently missing in India. There are very few cyber forensics research, training and educational centers in India. Similarly, cyber security research centers in India are also limited. Even lesser are digital evidencing and e-discovery centers in India. Cyber laws would also be relevant for areas like online dispute resolution (ODR) in India and e-courts in India. Cross border technology transactions and dispute resolution is the latest trend in the field of ODR. Further, legal issues of entertainment and media industry in India would also involve cyber law implications. DNS redirection and distributed denial of service attacks are these days used to protect IPRs and brands. These methods are strictly not legal and have serious cyber law implications. There are many more issues that are involved with cyber laws of India. However, they cannot be covered in a single post and we would cover them one by one in our subsequent posts. We hope readers would find this information useful. This entry was posted in Uncategorized on December 29, 2011 by PTLB. Electronic delivery of services is an efficient method of services delivery to public at large. Use of information and communication technology (ICT) eliminates many evils like lack of transparency, corruption, non accountability and brings order in public dealings. Recently an agreement was signed between the World Bank and Indian government that granted a loan of $150 million to India for the e-delivery of public services in India. As a condition precedent to get the benefits of such loan, electronic services delivery in India has been proposed in the past. However, e-delivery of public services in India would still take few years as we have no legal framework for mandatory e-governance in India. The proposed e-delivery of public services development policy loan of India has to be utilised through a policy and legislative framework that Indian government must establish very soon. The e-delivery of public services development policy loan (DPL) project of India would fail to take effect if either the electronic services delivery policy of India is not formulated or it is not implemented in a manner that confers mandatory e-governance services in India upon Indian citizens. In short, there should be a legal framework for e-governance in India that provides e-governance services to Indian citizens as a matter of right. In fact, policy changes in this regard are already visible in India. For instance, the financial limits of mobile banking transactions in India have been removed to give better options of banking in India. Similarly, SEBI is contemplating electronic initial public offer (EIPO) in India. Even Indian judiciary is exploring the possibility of using an electronic bail communication system in India. Through the proposed Cable TV Networks (Regulation) Second Amendment Bill 2011 of India, digital television services would be offered to consumers at affordable prices and with superior quality. To ensure e-delivery services in India, Indian government has proposed a draft electronic service delivery Bill, 2011 of India. This is a good step in the right direction. However, the proposed Draft Electronic Services Delivery Bill 2011 “failed” to provide mandatory e-governance services in India. The real problem with Indian e-governance initiatives in general and proposed ESD Bill 2011 in particular is that legal framework for mandatory electronic services delivery in India is still missing from it. The parliament of India must amend the proposed ESD Bill 2011 so that better form of the same can be provided. This entry was posted in Uncategorized on December 26, 2011 by PTLB. Social Media Websites in India are facing numerous challenges these days. From Technical Difficulties to Legal Challenges, Social Networking Sites in India are under constant pressure to comply with the Laws of India. Although there are no dedicated Social Media Laws in India yet the Cyber Law of India is prescribing certain provisions in this regard. Social Networking Sites must be aware of these Social Networking Laws of India as a failure to do so may attract Civil and Criminal Sanctions. Cyber Law Due Diligence in India is directly emanating out of Indian Information Technology Act 2000 (IT Act 2000) and it is also prescribing Cyber Due Diligence for Indian companies. Social Media Due Diligence in India is also flowing out of IT Act 2000 that very few in India have appreciated. Cyber Law on Social Media and Networking Sites in India demands exercise of “Due Care” and “Due Diligence” by these Websites and people managing the same. Of late, Social Media Websites in India are frequently made “Parties” to various Civil and Criminal Cases. The “Representatives” of these Websites are summoned by Courts of India vis-à-vis various Cyber Crimes and Cyber Contraventions. Cyber Crimes and Social Media Websites in India have become inseparable these days and this may make the individuals managing day to day affairs of such websites “Liable” for these Cyber Crimes and Cyber Contraventions. Cyber Due Diligence is also closely related to Internet Intermediaries Liability in India. Internet Intermediary Laws in India mandate that Social Media Websites must be “Diligent” while dealing with Cyber Crimes and Cyber Contraventions committed through their Platforms. Once the matter is “Brought to the Knowledge” of these social Media Websites, their liability “Accrues” as Internet Intermediary for these Cyber Crimes and Cyber Contraventions. Subsequently, they cannot deny either the “Knowledge” or their “Liability” for these Cyber Crimes and Contraventions. Even in the field of Intellectual Property Rights (IPRs), the liability of Social Media Websites may arise. For instance, Liability of Internet Intermediaries for Online Copyright Violations is very common. Even in India cases pertaining to Online IPRs Violations may grow in near future. However, there are some “Disturbing Trends” as well that may impact the growth of Social Media in India. For instance, the decision of Department of Information Technology (DIT) Minister Mr. Kapil Sibal to ask Social Media Websites Of India to Pre Screen Users Contents before posting in neither Possible nor Feasible. Fortunately, Mr. Kapil Sibal “clarified” that DIT do not wish Social Media Websites in India to Pre Screen Users Contents. Similarly, any decision to Ban or Block a Social Media Website or any other Website that is used by large segment of Public in India for alleged or potential Cyber Crimes or Online IPRs Violation or Cyber Contravention would be a “Bad Decision”. What is more surprising regarding Blocking of Websites in India is that the same is often done without much “Application of Mind”. Simply because a Party has asked for Blocking of a Website in India from a Court in India should not be a “Sufficient Ground” to grant such permission. In India Websites have been blocked for reasons that cannot stand any sort of “Judicial Scrutiny”. Ironically, it is the Indian Judiciary itself that is granting Blocking of Websites in India as a “Matter of Right” of the Complainant. The Ignorant Judicial Websites Blockings in India has increased a lot. What is more surprising is that Internet Service Providers (ISPs) like Reliance simply files a case and gets an Ex Parte or other “Favourable Order” from an Indian Court. Then they simply Block the Websites without analysing the “Legality’ of such an action. However, the “Fault” lies with Indian Judiciary that grants such “Blanket Orders of Blocking” without going into the “Merits of the Case”. For instance, how can a Court decide that a File Hosting or File Sharing Website can “Possibly Violate” the IPRs of the Complainant? By issuing such “Blocking Order”, that also in an Ex Parte Mode, Indian Judiciary is making the Indian Cyberspace more “Unpredictable and Unreasonable”. In my personal opinion, Websites Blocking in India by Indian Judiciary is neither Strictly Legal nor Strictly Constitutional and Constitutional Courts of India must take note of this unfortunate fact. The real solution to this problem lies at enacting a Social Media Policy of India by Indian Government that can be a “Guiding Factor” for all, including Indian Judiciary. Suitable Framework and Guidelines for use of Social Media by Government Organisations in India must also be enacted and implemented properly. Indian Social Media Framework and Guidelines for Government Organisations has already been framed and all that is required is its “Proper and Actual Implementation” in India. The Guidelines for Social Media Contents Monitoring in India may also be issued very soon. Social Media Websites Due Diligence in India needs to be taken “Seriously” by all Stakeholders. However, there need to be a “Harmony” between executive, Judiciary and parliament in India. The “Chaos” through which Social Media Jurisprudence in India is suffering must be removed as soon as possible. Right to privacy in India is a constitutional right. Efforts are in the process to make it a statutory right as well. A dedicated statutory right to privacy in India is in pipeline in the form of right to privacy bill of India 2011. The proposed Bill must protect human rights in cyberspace to be valid and constitutional and it must respect the privacy rights of Indians in the information age. The proposed draft right to privacy bill 2011 of India may confer some form of privacy rights to Indians. However, its true scope is yet to be made public. Indian government launched projects like Aadhar, National Intelligence Grid (Natgrid), Crime and Criminal Tracking Network and Systems (CCTNS), National Counter Terrorism Centre (NCTC), Central Monitoring System (CMS), Centre for Communication Security Research and Monitoring (CCSRM), etc. None of them are governed by any Legal Framework and none of them are under parliamentary scrutiny. Further, there are some very crucial issues that are posing constitutional problems for the intelligence and security agencies of India. For instance, intelligence gathering in India is unconstitutional. Similarly, counter terrorism capabilities of India are not sufficient and Indian counter terrorism capabilities needs rejuvenation. Finally, parliamentary oversight and constitutional safeguards are missing in the functions of these agencies. India does not have a constitutionally sound lawful interception law. 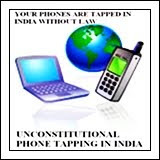 Phone tapping in India is still done in an unconstitutional manner and at times by private individuals as well. Further surveillance of Internet traffic in India is now openly acknowledged by Indian government. The intelligence infrastructure of India has become synonymous for non accountability and mess. There is neither any parliamentary oversight nor and transparency and accountability of the working of intelligence agencies of India. Intelligence infrastructure of India needs rejuvenation keeping in mind the constitutional obligations. The draft Intelligence Services (Powers and Regulation) Bill, 2011 has failed to take the shape of a law in India and it has been announced that law on intelligence agencies would be formulated soon. Even the Draft Central Bureau of Investigation Act, 2010 has failed to become an applicable law. E-surveillance in India, websites blocking in India, Internet censorship in India, etc are also not done a strictly constitutional manner. Till now Indian courts have not tested the acts of intelligence agencies. Recently Indian research and analysis wing (RAW) was granted e-surveillance powers without any legal framework. Now the home ministry of India is demanding that intelligence and law enforcement agencies must be kept out of the purview of the proposed Privacy law, and should be allowed to continue monitoring the activities and carry out electronic surveillance of citizens. Home ministry is suggesting that the way intelligence and investigation agencies are exempted under schedule 2 of the Right to Information (RTI) Act, they should be kept out of the proposed privacy Bill in view of national security. Home ministry do not wants the privacy Bill to interfere with intelligence gathering activities even if means accommodating more safeguards in line with the sprit of the privacy Bill. This seems to be an unreasonable demand as we must now stress upon great parliamentary scrutiny of intelligence agencies and law enforcement agencies. On the contrary we are diluting the constitutional freedoms and procedural safeguards. It is high time for parliament of India to interfere and enact constitutionally sound laws in this regard. This entry was posted in Uncategorized on December 21, 2011 by PTLB. This entry was posted in Uncategorized on December 18, 2011 by PTLB. Cyber law due diligence in India has become very stringent. This applies to various fields and to multiple stakeholders. For instance, cyber due diligence for banks in India is now a well known requirement for banks in India. However, Internet intermediaries are the most widely covered stakeholders in this regard. Intermediaries liability for cyber law due diligence in India is really tough. In absence of a clear cut Internet intermediary law in India, Indian government is indulging in Internet censorship in India. Stringent directions are frequently issued to Internet intermediaries under the rules of information technology act 2000. This occasionally results in censorship of Internet in India. Further, Indian government is now openly acknowledging surveillance of Internet traffic in India. E-surveillance in India and surveillance of Internet traffic in India have increased to a considerable limit that now requires judicial scrutiny. Censorship of Internet in India should be challenged as soon as possible in the larger interests of Indian Internet users. Recently Internet intermediaries in India have been asked to pre screen contents before they are posted on their websites. India wants companies like Google and Facebook to censor users’ contents before they are posted. In fact, Yahoo has filed a petition raising the questions regarding the right to privacy of a company that stores sensitive data of its customers and users and to what extent authorities can coerce it to part with the information considered necessary to either track terror perpetrators or thwart future attacks. The Google’s outcry for lack of Internet intermediary law in India is another example of growing dissatisfaction towards Indian cyber laws, especially Internet intermediary laws of India. Time has come for Indian government to address the issues of enacting sound and effective Internet intermediary laws in India and cyber due diligence requirements for internet intermediaries in India. This entry was posted in Uncategorized on December 8, 2011 by PTLB. When information technology act 2000, the sole cyber law of India, was amended through the information technology amendment act 2008, very few people opposed the same. The provisions of the proposed IT Act 2008 were draconian and without constitutional and procedural safeguards. This is the reason why self defense mechanisms against state were also advocated to counter illegal and unconstitutional e-surveillance and internet censorship. However, commercial enterprises and internet intermediaries silently accepted the amendments without realising its far reaching consequences. Now e-surveillance in India has become a big nuisance for intermediaries like internet service providers (ISPs), e-commerce sites, search engines, e-mail providers, etc. The liability of Internet intermediaries for copyright violations would also create problem for intermediaries in India. Intermediaries liability for cyber law due diligence in India has become very stringent after the IT Act 2008. The IT Act 2000 now carries many e-surveillance, websites blocking and Internet censorship provisions and Indian government is openly using these provisions without following the constitutional requirements. Recently, through a petition, Yahoo has raised questions regarding the right to privacy of a company that stores sensitive data of its customers and users and to what extent authorities can coerce it to part with the information considered necessary to either track terror perpetrators or thwart future attacks. The matter must also be looked from another angle. Human rights protections in cyberspace in India are not safeguarded at all. Even at the international level United Nations has not shown much interest in protecting civil liberties in cyberspace. The data privacy laws in India are also missing. In short, there is complete negation of human rights in cyberspace in the Indian context. Now the Indian government has asked Internet companies like Google, Microsoft, Yahoo and social media sites like Facebook to prescreen user content from India and to remove disparaging, inflammatory or defamatory content before it goes online. Top officials from the Indian units of Google, Microsoft, Yahoo and Facebook have met with Kapil Sibal in this regard. Kapil Sibal has told them that he expected them to use human beings to screen content instead of the automated technology. However, these companies believe that his demand is impossible to fulfill keeping in mind the nature of internet and user generated contents. Let us see how things would take shape in this regard. This entry was posted in Uncategorized on December 5, 2011 by PTLB. Phone tapping in India is regulated by outdated and ancient law known as Indian Telegraph Act 1885 and corresponding rules there under. As per section 5 of the telegraph act, the central government or state government is empowered to order interception of messages. Rule 419 and 419A sets out the procedure of interception and monitoring of telephone messages. As per Rule 428 of the India telegraphic rules, no person without the sanction of the telegraph authority, use any telephone or cause or suffer it to be used, purposes other than the establishment of local or trunk calls. However, in practice whatever little safeguards provided by the act are seldom followed. Phone tapping by private individuals in India is rampant and even governmental phone tapping is unaccountable. We have no constitutionally sound lawful interception law in India. Even the Home Ministry of India is considering enactment of a lawful Interception Law in India. It is suffice to say that this unconstitutional phone tapping in India and illegal e-surveillance in India is a “constitutional failure of India”. India urgently needs a valid phone tapping law. The central monitoring system project of India (CMS Project of India) is also not supported by any legal framework. This is the real problem for the CMS Project of India. We have no dedicated privacy laws in India, data security laws in India and data protection laws in India. Further, the CMS Project of India is also beyond the “parliamentary scrutiny”. Further, we have no e-surveillance policy in India. Even phone tapping in India is done in an “unconstitutional manner” and even by private individuals with or without governmental approval. Recently even the Supreme Court of India took a serious note of the growing and blatant incidences of privacy violation in India by Indian government and private individuals/companies supported by it. Supreme Court went upto the extent of saying that no person living in India is safe from privacy violations and omnipresent forgeries prevalent in India. The present practice of Indian government regarding phone tapping, e-surveillance and e-interceptions is far from being legal and constitutional. India urgently needs a constitutionally sound lawful interception law. Let us hope the Supreme Court would bring some order in the otherwise chaosed banana republic of India. Pendencies of cases in Indian courts are normal phenomenon these days. Delay in resolution of disputes adversely affects the confidence of business community and international investors. While traditional litigation system of India cannot be reformed overnight yet effective steps in this direction must be urgently taken. Technology can be a viable option for resolving judicial problems in India. For instance online dispute resolution (ODR) mechanism can be effectively used to resolve many disputes in an online environment. Similarly, e-courts in India can be established to reduce corruption and irregularities of Indian judicial system. There is no second opinion that e-courts in India needed. However, establishment of e-courts in India is still a dream as e-courts project of India has failed to provide the necessary impetus in this regard. There are many reasons why e-courts in India failed to take off. The chief among them is the absence of necessary expertise to manage and implement e-courts project of India. For instance, we have a single techno legal e-courts training and consultancy centre in India. It is managed by Perry4Law Techno Legal Base (PTLB). We need more such specialised institutions to successfully manage the e-courts project of India. Recently on the occasion of Law Day, Union law minister Salman Khurshid shared his desire for making court proceedings paperless. He asked whether Indian Supreme Court can be paperless. Citing the example of Brazil he stressed that India needs to move in that direction as well. The idea is good provided India has necessary expertise and will to implement the e-court project of India. Presently that seems to be missing and this make the paperless court a distant dream in India. This entry was posted in Uncategorized on December 4, 2011 by PTLB.